Valentines Day Present Ideas - Dare To Be DIfferent! Valentines Day Present Ideas - This Is One Idea That Will Truly Surprise Your Valentine! So many valentines day present ideas are the same... We give chocolates, roses, a bottle of wine, a fine dinner out. And all of these are wonderful ideas! BUT maybe this year YOU are ready to do something really different! How about a gift that is not only memorable for your loved-one, but also something that is quite surprising! A gift that shows you gave your Valentine's Day offering some real thought and energy this year! 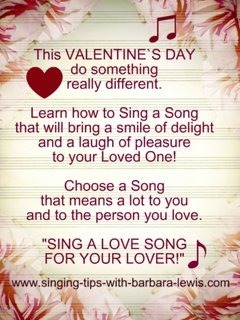 Why not... "SING A LOVE SONG FOR YOUR LOVER!" As Valentines Day Present Ideas go - this one is truly unique. NO ONE will sing like YOU! Whether you have developed your voice or not. The gift of a song on Valentine's Day is bound to be precious and memorable. Watch the short video below to learn about how easy it can be to use your own talent as a great gift. I understand only too well how you might feel shy about taking on a project like this. But I believe that almost everyone can sing. (Some people do have injuries that prevent them from singing.) Not all of us can become professional singers. Most people would not want that kind of a career! But there is NOTHING like sending your feelings out on the wings of your own vocal sound. And you do not have to sing wonderfully to make your feelings known to those you love. So think about this opportunity to Sing A Love Song For Your Lover! I will help you learn a song that is right for your voice and your occasion. 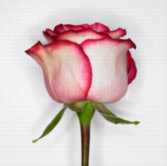 And you will have the great joy of offering a Valentines Day gift that will no doubt bring lasting pleasure your loved one. P.S. Look here for Romantic Words & Actions That Will Keep Your Love Glowing!